North Korea is seeking to expand its foreign trade by turning to the EU and BRICS (Brazil, Russia, India, China and South Africa) for cooperation. The book also stated that North Korea is engaging in a wide range of international trade such as economic cooperation and looking into cooperative business models with Europe, Southeast Asia, Latin America, the Middle East and Africa as well as with international and regional economic organizations such as the EU and BRICS. However, seeing as the book does not specify detailed ways in which North Korea will take to cooperate with the EU and BRICS, the plan appears as a mere hope. The book also noted that the diversification of active foreign trade will enable “the expansion of width and depth of distribution through dealing with more countries on various industries on many accounts.” The diversification in this context refers to the people in charge of trade and the methods of trade. Continuing on the idea of diversification, the book mentioned that “not only does the diversification of foreign trade not contradict itself with the independence of national economic stability, but it actually is an important asset in developing the ability of economic independence and its capability,” meaning that diversification should be a key foundation in building an independent economy. The book explained that the independence of economy is the enhancement of people’s identity and independence that is linked to the domestication of materials. Therefore, beginning with coke (coal) gasification, Juche-iron, Juche-refractory material production line, Juche-fertilizer, and Juche-textile production line will be completed, for instance. You can see the list here (PDF). 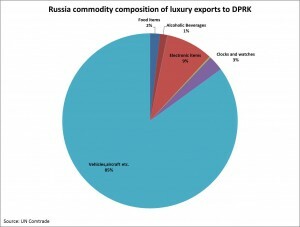 I have added this to my DPRK economic statistics page. There is no similar list (as best I can tell) published by the US government (Please correct me if I am wrong). But links to tools created by the different offices in the US government can be found on my DPRK economic statistics page. I suspect a little research on with tools could be used to produce such a list. The closest I have seen to a complete list is here (PDF). UPDATE: Josh Stanton offers this link. NK News reports that the European Commission also tightened sanctions on the DPRK. See Josh Stanton’s summary here. More than 40 European businessmen in South Korea traveled across the heavily fortified border into North Korea on Tuesday for a rare trip to an inter-Korean factory park amid tensions on the Korean Peninsula, a unification ministry official said. A 42-member delegation of the Korean-German Chamber of Commerce and Industry in Seoul plan to tour facilities and South Korean factories in the North’s western border city of Kaesong before returning home later in the day, the official said. The delegation includes officials of the German engineering giant Siemens AG and BMW, a premium German automaker. It also includes Swiss nationals and Austrians, according to the official. Separately, about 40 South Korean business leaders from around the world also plan to visit the factory park in Kaesong on Friday, according to the unification ministry official. In December, about two dozen officials from the world’s G-20 economies toured the Kaesong complex on the sidelines of their global financial meeting in Seoul. The sprawling enclave in Kaesong is home to 120 small South Korean plants producing garments and other labor-intensive goods. More than 44,000 North Koreans work in the complex. The Belgium branch of Handicap International earmarked $1.12 million for this year to support medical and rehabilitation facilities in the communist country to promote the health and well-being of the disabled there, the Voice of America (VOA) reported, citing an e-mail from the agency’s official Dominique Delvigne. The budget is also to be spent for such projects as nurturing teachers in charge of special education for visually- and hearing-impaired people, and assisting the (North) Korean Federation for the Protection of the Disabled (KFPD), the official added. The NGO, established in 1982 to help disabled and vulnerable people in situations of poverty and exclusion, conflict and disaster, began to help physically challenged people in North Korea in 1998 at the request of the KFPD. International sanctions against North Korea are leading to declining bilateral trade volumes with the European Union (EU), it has been revealed. “The total amount of trade between North Korea and the EU in 2012 fell 40%, from 159,000,000 Euros in 2011 to 92,000,000 Euros in 2012,” Voice of America reported yesterday, citing the latest trade statistics from the European Commission. 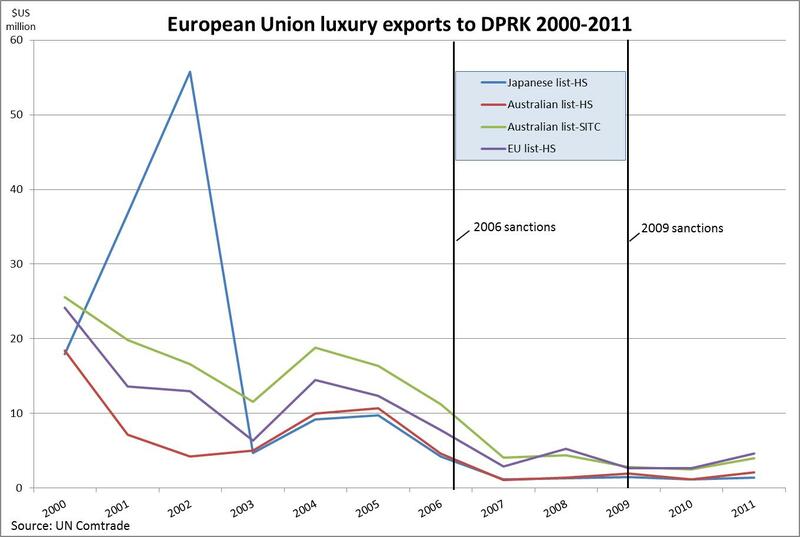 The root of the decline lies in exports from North Korea; in other words, Pyongyang’s exports to the EU decreased dramatically, and this led to an overall decrease in bilateral trade. 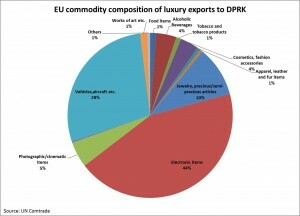 North Korean imports from the EU last year amounted to 73,000,000 Euros, a 60% increase from the previous year. However, exports in the same period were only worth 19,000,000 Euros, not even 1/5 of the previous year’s 116,000,000 Euros. 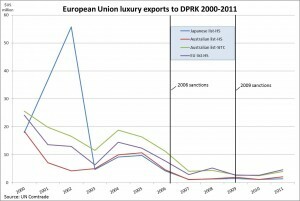 A report released by the Korean International Trade association last month yielded a similar outcome, concluding that trade between North Korea and the EU in the first five months of 2013 was on a declining curve, being worth just 12,500,000 Euros, a 77% decrease over the same period of 2012. The EU also reported that North Korea’s foreign trade last year was worth 690,000,000 Euros overall. 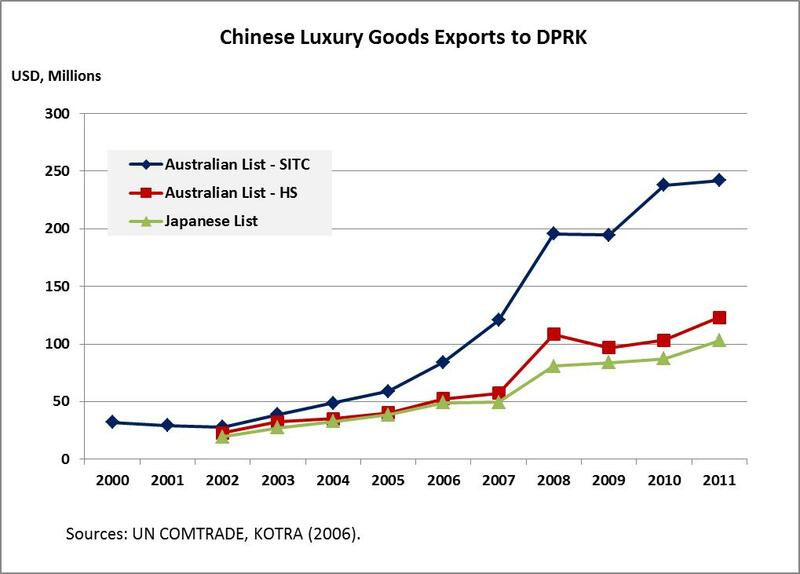 North Korea’s biggest trade partner was China, with 470,000,000 Euros, 68% of total foreign trade. 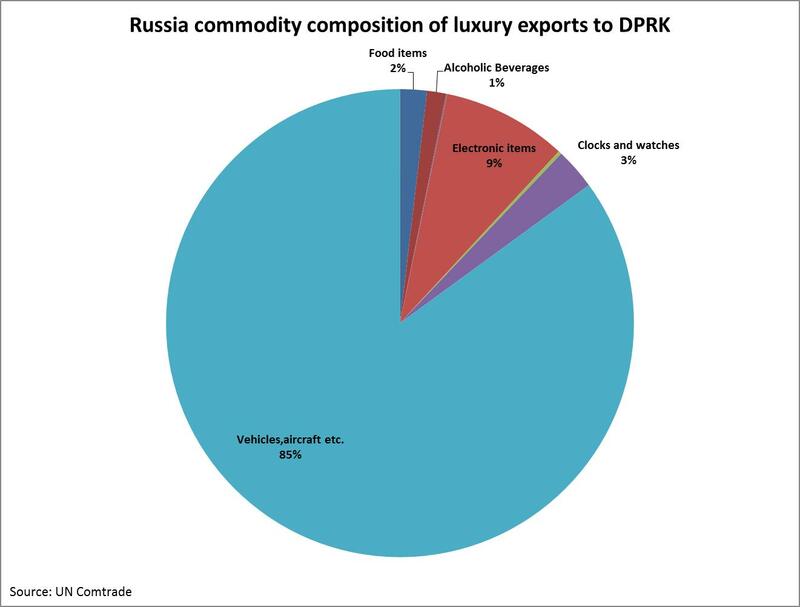 North Korea’s other major trade partners in 2012 India, the Democratic Republic of Congo, Saudi Arabia, and the Dominican Republic. Trade volume between North Korea and the European Union (EU) more than halved last year from a year earlier after the North sharply cut exports of mineral resources, a news report said Friday. The trade volume between the two sides came to 69 million euros (US$90.2 million) in 2012, only 43.4 percent of the 159 million euros recorded the previous year, the Washington-based Voice of America (VOA) reported, citing EU data. The dive came as the North’s total exports to the EU shrank to 24 million euros last year from 117 million euros the previous year, according to the VOA report. The communist country exported only 3 million euros worth of mineral resources, the main export item, to EU countries in 2012, compared with 71 million in 2011, it said. 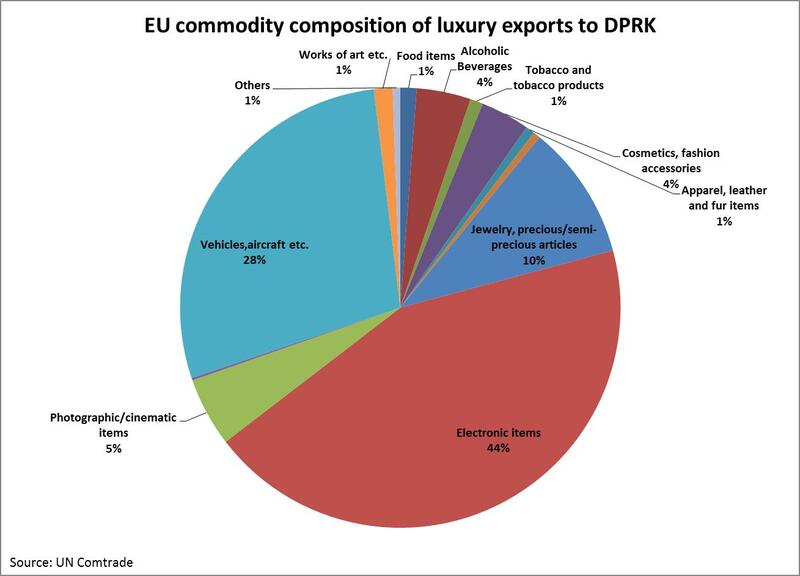 North Korea’s imports from EU countries, meanwhile, rose 7.1 percent on-year to 45 million euros last year, led by brisk imports of machinery and electronics goods, according to the report. 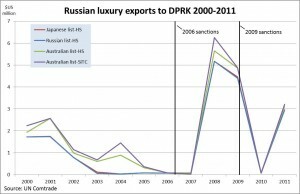 This fall Marcus Noland has posted three blog entries which feature DPRK trade statistics with China, the European Union, and Russia. I have put the graphs from these posts here as both an archive and as a quick reference for myself. See Dr. Noland’s original posts (linked above) for his analysis. In December 2010, North Korea began asking multiple countries for food aid. Its request to the U.S. came in early 2011, but it wasn’t until December 2011 that a deal seemed close, with the U.S. prepared to provide 240,000 metric tons (MTs) of assistance. Kim Jong Il died soon after this news hit the press, and details of the potential deal were never announced. In the ideal world, Ronald Reagan’s “hungry child” knows no politics. But the case of North Korea is far from ideal. The U.S. government states it does not take politics into consideration when determining whether to provide aid to North Korea. Instead, the decision is based on three criteria: need in North Korea, competing demands for assistance, and the ability to monitor aid effectively. Yet these three criteria are subjective and tinged by politics. In 2011 a succession of four assessment delegations (one by U.S. NGOs, one by the U.S. government, one by the EU and one by the UN) visited the DPRK. All found pretty much the same thing: widespread chronic malnutrition, especially among children and pregnant or lactating women, and cases of acute malnutrition. The UN confirmed the findings late last year, reporting chronic malnutrition in children under five in the areas visited — 33% overall, and 45% in the northern part of the country. Some donors responded quickly. For example, shortly after its July assessment, the EU announced a 10 Million Euro donation. Following its own May assessment, however, the U.S. government was slow to make a commitment. Competing demands may have played a role. In July, the predicted famine in the Horn of Africa emerged, prompting a U.S. response of over $668 million in aid to “the worst food crisis in half a century.” While there was no public linkage between U.S. action on the African famine and inaction on North Korea, there could have been an impact. South Korea’s ambivalence about the extent of the food crisis was noted by Capitol Hill, exacerbating congressional reluctance to support food aid. A letter to Secretary Clinton sent shortly before the U.S. assessment trip in May began with Senators Lieberman, McCain, Webb and Kyl explaining they shared South Korean government suspicions that food aid would be stockpiled and requesting State to “rigorously” evaluate any DPRK request for aid. With the close ROK-U.S. relationship one of the administration’s most notable foreign policy accomplishments, such a warning may have carried some weight. Monitoring is of equal, if not greater congressional concern. Since the 1990s U.S. NGOs and USAID have worked hard with DPRK counterparts to expand monitoring protocols, and conditions have consistently improved over time. In the 2008/2009 program, the first food program funded by the U.S. government since 2000, the DPRK agreed to provisions such as Korean-speaking monitors. The NGO portion of the program was fairly successful in implementing the monitoring protocol; when implementation of the WFP portion hit some bumps, USAID suspended shipments to WFP until issues could be resolved. 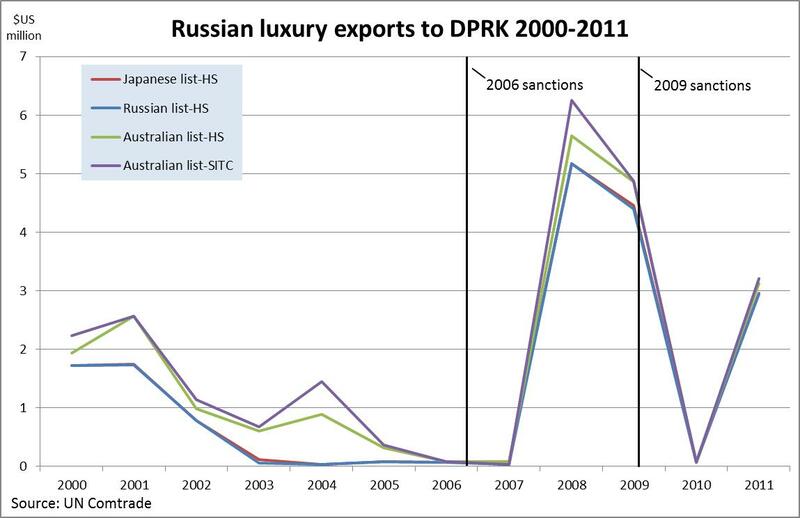 The DPRK ended the program prematurely in March 2009 with 330,000 MT remaining. In 2011 the Network for North Korean Human Rights and Democracy conducted a survey of recent defectors to examine “aid effectiveness” in the current era. Out of the 500 interviewees, 274 left the DPRK after 2010. However, only six were from provinces where NGOs had distributed aid in 2008/2009. Disturbingly, of the 106 people interviewees who had knowingly received food aid, 29 reported being forced to return food. Yet the report doesn’t state their home towns, or when the events took place. Unfortunately such incomplete data proves neither the effectiveness nor ineffectiveness of the most recent monitoring regime. Some believe that adequate monitoring is impossible. The House version of the 2012 Agricultural Appropriations Act included an amendment prohibiting the use of Food for Peace or Title II funding for food aid to North Korea; the amendment was premised on this belief. However the final language signed into law in November called for “adequate monitoring,” not a prohibition on funding. The U.S. response, nine months in the making, reflects the doubts outlined above and the politically challenging task of addressing them. It took months for the two governments to engage in substantive discussions on monitoring after the May trip. In December, the State Department called the promised nutritional assistance “easier to monitor” because items such as highly fortified foods and nutritional supplements are supposedly less desirable and therefore less likely to be diverted than rice. The reported offer of 240,000 MT– less than the 330,000 MT the DPRK requested – reflects the unconfirmed report that the U.S. identified vulnerable populations but not widespread disaster. In early January, the DPRK responded. Rather than accepting the assistance that was under discussion, it called on the United States to provide rice and for the full amount, concluding “We will watch if the U.S. truly wants to build confidence.” While this statement has been interpreted positively by some as sign of the new Kim Jong Un regime’s willingness to talk, it also demonstrates a pervasive form of politicization – linkage. A “diplomatic source” in Seoul said the December decision on nutritional assistance was linked to a North Korean pledge to suspend its uranium enrichment program. Linkage can be difficult to avoid, and the long decision-making process in 2011 may have exacerbated the challenge. Although Special Representative Glyn Davies was quick to state that “there isn’t any linkage” between the discussion of nutritional assistance and dialogue on security issues, he acknowledged that the ability of the DPRK and US to work together cooperatively on food assistance would be interpreted as a signal regarding security issues. Meanwhile, the hungry child in North Korea is still hungry. Despite the South’s softer stance, North Korea recently threatened to turn Seoul’s presidential office into “a sea of fire” in response to South Korea’s military maneuvers near the tense western sea border. North Korean workers earn only 3,000-4,000 won per month. This unusual hike in rice price seems to be related to preparation of next year’s political propaganda projects. With barely a month left until 2012, the year in which people were promised a radical lifestyle transformation to coincide with the North Korea’s rebirth as a ‘strong and prosperous nation’, programs calling upon people to conserve food are now being broadcast by Chosun Central TV and the fixed-line cable broadcaster ‘3rd Broadcast’. Chosun Central TV is broadcasting the programs as part of ‘Socio-Culture and Lifestyle Time’, which begins directly after the news on Thursdays at 8:40pm. The majority of the content is apparently now about saving food. In one such program, Professor Seo apparently noted, “In these days of the military-first era there is a new culture blossoming, one which calls for a varied diet,” before encouraging citizens to eat potatoes and rice, wild vegetables and rice and kimchi and rice rather than white rice on its own, and then adding that bread and wheat flour noodles are better than rice for lunch and dinner. It is understood that older programs with titles such as ‘A Balanced Diet is Excellent Preparation for Saving Food’ and ‘Cereals with Rice: Good for Your Health’ are also being rebroadcast, while watchers are being informed that thinking meat is required for a good diet is ‘incorrect’. Whenever North Korea is on high alert or there is a directive to be handed down from Kim Jong Il, both of Chosun Central TV and the 3rd Broadcast are used to communicate with the public. For this reason, some North Korea watchers believe the recent food-saving campaign may reflect a particularly weak food situation in the country going into the winter. North Korea’s orphanages are full of malnourished children and food shortages in the isolated nation look set to get much worse, said a recent visitor who knows the country well. Former member of the European Parliament Glyn Ford said shortages of food were affecting “tens of thousands of children, not just orphans, and there may be millions of people under threat of malnutrition” in North Korea. Ford visited two orphanages in Hamhŭng (Hamheung), the country’s second largest city, where he was shown children who were extremely thin and clearly malnourished, and this had been confirmed by a European Union aid team. Each orphanage had about 300 children. Ford said he had been encouraged by an EU pledge last month to provide emergency food aid worth 10 million euros ($14.3 million) to more than half a million people at risk of dying from serious malnutrition in North Korea, and that France and Germany had since added to this, making the assistance worth 14-16 million euros ($20-$22.8 million). But at one of the orphanages he was told they had run out of EU food in June, and the children were suffering as a result. The European Commission said the objective of the aid package was to lift around 650,000 people, mainly in northern and eastern provinces of the country, out of the hunger zone during the most difficult period of the worst year for food production in recent times. Food assistance will reach children under five who have already been hospitalised with severe acute malnutrition. Children in residential care will also be fed, as well as pregnant and breastfeeding women, hospital patients and the elderly. An EU mission found in June that state-distributed food rations, upon which two thirds of the North Korean population depend, had been severely cut in recent months from 400g of cereals per person per day in early April to 150g in June: less than 400kCal – a fifth of the daily average nutritional requirement and equivalent to a small bowl of rice. Ford told NKEW in a telephone interview that while there were clear signs of widespread hunger there was no sign, so far at least, of mass starvation, as happened in the 1990s, when hundreds of thousands, possibly millions, of people died. “kiosk capitalists” who were bucking the traditional, Stalinist economic system. “This is a society where there are rich North Koreans. There are new cars and expensive consumer items in the shops. There is an economic elite rather than a Party elite,” he added. Ford also visited the Kaesong (Gaeseong) Industrial Complex just north of the Demilitarised Zone, which he said consisted of large areas of waste land where plans for expansion had come to nought due to increased tension between North and South Korea. The complex looked “a little bit sad”, he said, and the optimism that prevailed when he last visited it two or three years had dissipated. He said the zone continued to employ about 45,000 North Koreans, little changed from his previous visit, and hopes that it would employ 400,000 by 2015 now seemed highly unrealistic. “It was new then but the shining glow has gone off a bit,” he said, adding, “I noticed the gaps between the factories more than the factories themselves.” (Ford cited a goal of 400,000 workers eventually employed in the zone, but in 2006 a target of 700,000 was mentioned on the BBC’s Newsnight programme). The complex, in operation since 2004, has around 120 factories, all South Korean-run, processing food and assembling clothing and machinery for export to the South. Ford also said it seemed likely that the North Korea would open an embassy to the EU in Brussels before long, with a reciprocal EU embassy in Pyongyang. Although Pyongyang and the EU established diplomatic relations in 2001, embassies have not been opened due to French resistance, as France and Estonia are the only EU countries that do not have full diplomatic ties with North Korea. France has cited human rights violations in its refusal to open an embassy in North Korea, but it has recently softened its line and has announced plans to open a “cooperation bureau” in Pyongyang. Ford said North Korea had long wanted to set up an embassy in Brussels and this now finally seemed likely, possibly by the middle of next year. Ford, a British Labour Party MEP until 2009, spent about 12 days in North Korea, returning last Saturday. He has almost certainly visited North Korea more often than any other western politician, having been almost 20 times over the last 15-16 years. He was a member of the European Parliament’s Korean Peninsula delegation and in 2008 has published a book, North Korea on the Brink: Struggle for Survival. Addendum: In January 2009 Ford hosted the first ever delegation from the Workers’ Party of Korea (WPK) delegation to visit Britain, when he pressed them to agree to reopen the dialogue that was broken off in 2005.